With National Offset Warehouse, the more you order the more you save. Check out the site to get volume pricing on Superblue nets and other consumable products for your plant. 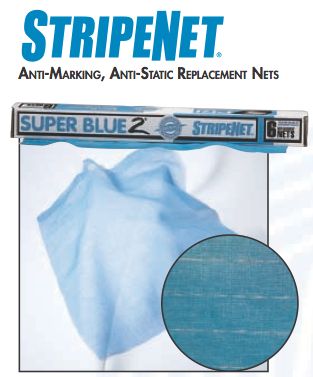 We carry Original Superblue nets with Stripe and well as the precision cut Superblue 2 stripenet. National Offset Warehouse are made of Superblue experts. We have over 20 years experience working with the manufacturer (Printing Research Inc) and selling Superblue Base Covers, Nets, and other anti marking solutions. If you have any questions about the fit or specific net for your press, give us a call at 1-800-669-0654, we are happy to help any way we can, or email us at sales@nationaloffset.com.